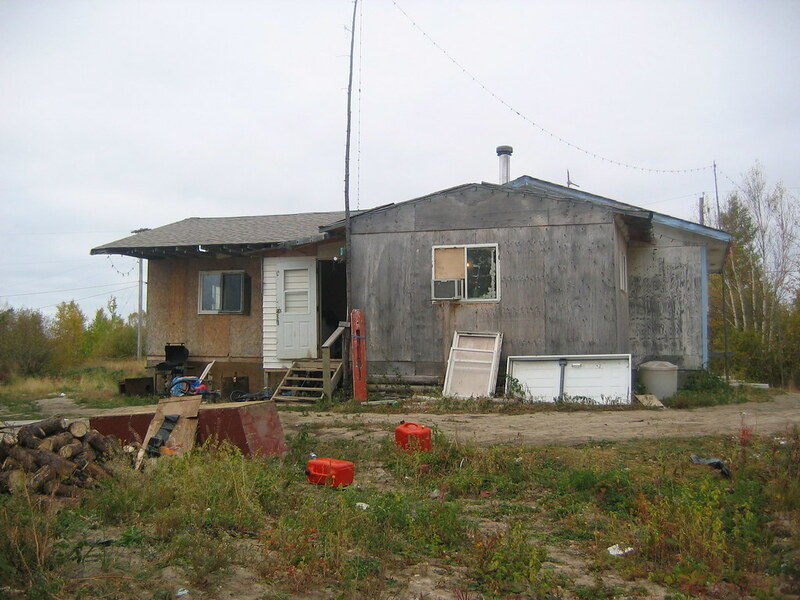 Aboriginal people in remote parts of Canada often live in squalid conditions that you would expect to see in developing countries. 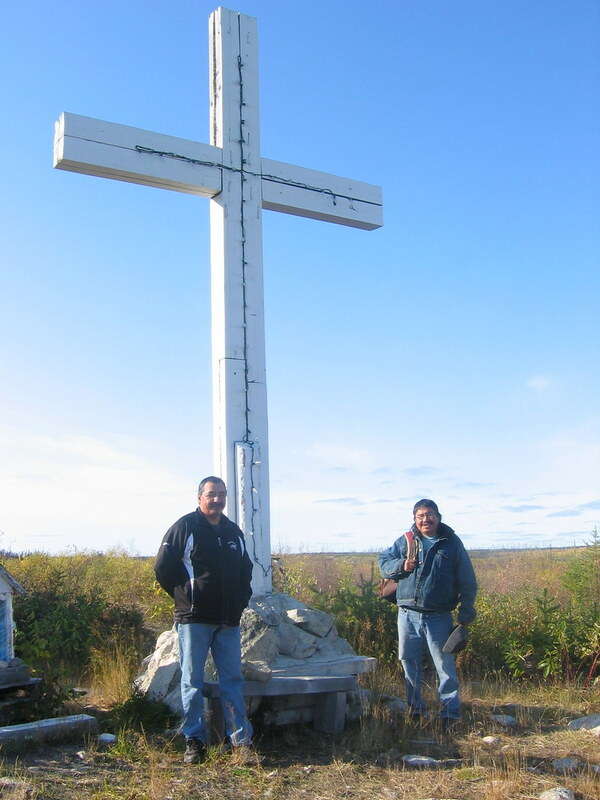 In Wasagamack, a First Nation reserve in Manitoba, hardly anyone has running water. The H1N1 virus poses a threat. It is 7:30 in the morning, time to get up in the primitive home of Victor Harper in a remote First Nation reserve in Canada’s Manitoba province. Children and grandchildren fill the living room of his small bungalow in Wasagamack, an isolated settlement of the Ojibway population. The walls of untreated wood panels are decorated with feathers and other objects. Heat comes from a wood stove. 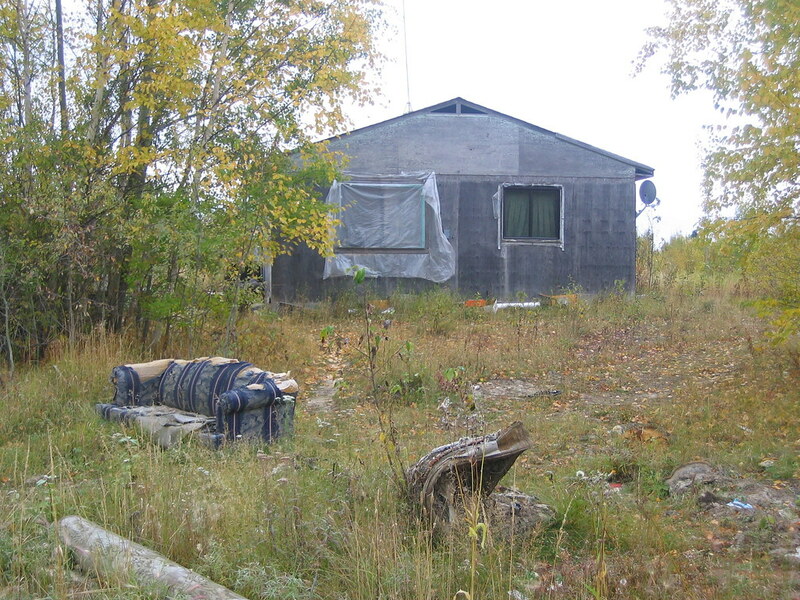 One by one, family members go outside to use the toilet: a drafty wooden cabin behind the house with a hole in the ground and a Styrofoam edge as a toilet seat. In winter, when temperatures are below freezing, a bucket can be used inside. The kitchen has a stainless steel bowl with foamy water and a small bar of soap. “You can wash you face there,” says Harper, 58. His daughter scoops water with a jug from a container lined with a garbage bag to make coffee. That ominous message is making the rounds in Wasagamack, a First Nation reservation of about 1,700 people, more than 600 kilometers north of Winnipeg. 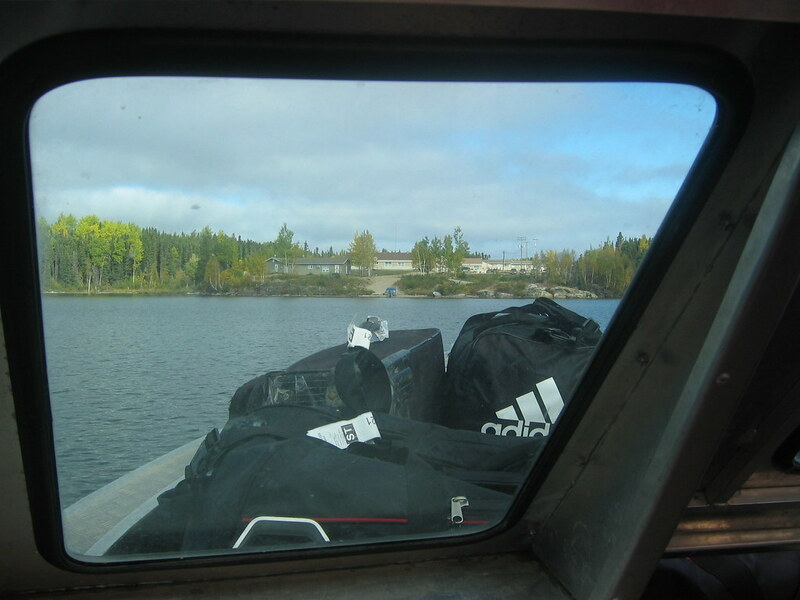 Wasagamack is only accessible by plane followed by a boat ride, and is therefore relatively sheltered from the swine flu pandemic. But if the H1N1 virus strikes in a place like this, it is feared that it will spread rapidly, with deadly consequences. That’s because indigenous peoples are a risk group for the new, so-called Mexican flu. A nearby reserve, St. Theresa Point, was severely affected by the disease this spring. The community was quarantined, and patients had to be flown to Winnipeg for treatment. 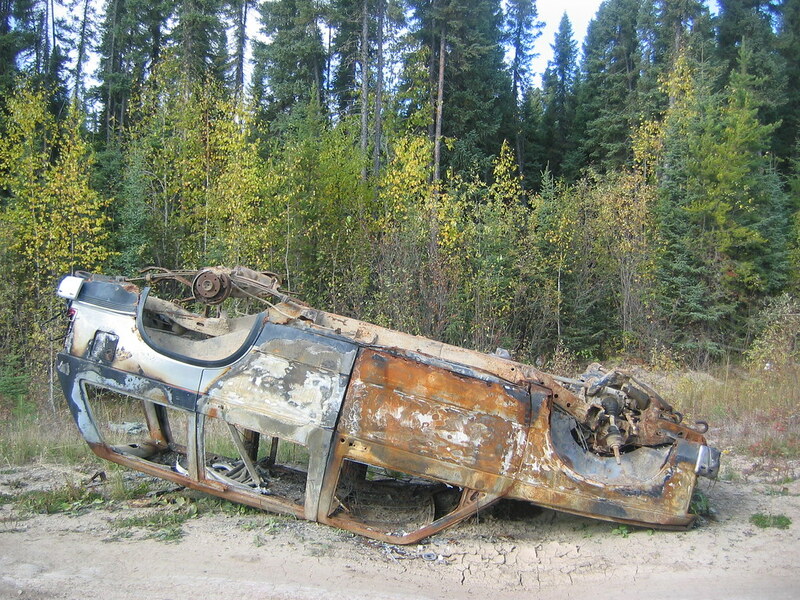 Intensive care units there were full of sick First Nations people. More than a third of the nearly 900 cases in Manitoba were indigenous patients. The aboriginal population pushed the infection rate in Canada well above that in the United States and Mexico (24 cases per 100,000 people, compared with 11 and 9, respectively). Indigenous people are at higher risk of getting the swine flu. In Canada, they represent less than 4 per cent of the population (1.2 million to 32 million), but so far they have made up 17 per cent of hospital patients with H1N1, and 11 per cent of fatalities. In other parts of the world, such as Australia and South America, indigenous people are also threatened by the pandemic, human rights organization Survival International wrote in a recent report. That has to do with the appalling living conditions of most indigenous people. 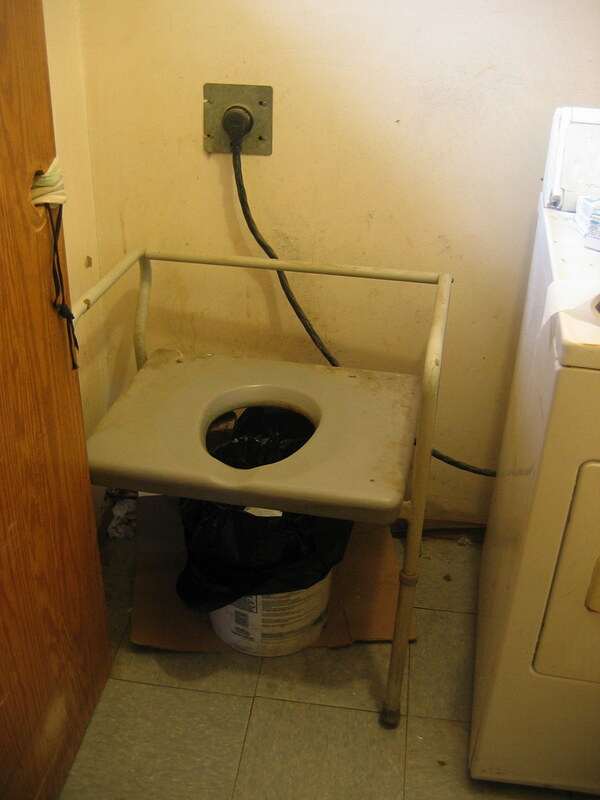 They often live with large families in small homes with a dire lack of sanitation – fertile ground for infection. Because of a high birth rate and a lower life expectancy, the average age among native people in Canada is about 15 years lower than the national average – also a risk factor for swine flu. In addition, indigenous people are vulnerable because many already suffer from chronic diseases such as diabetes and obesity. Wasagamack is struggling with all those issues, starting with housing. 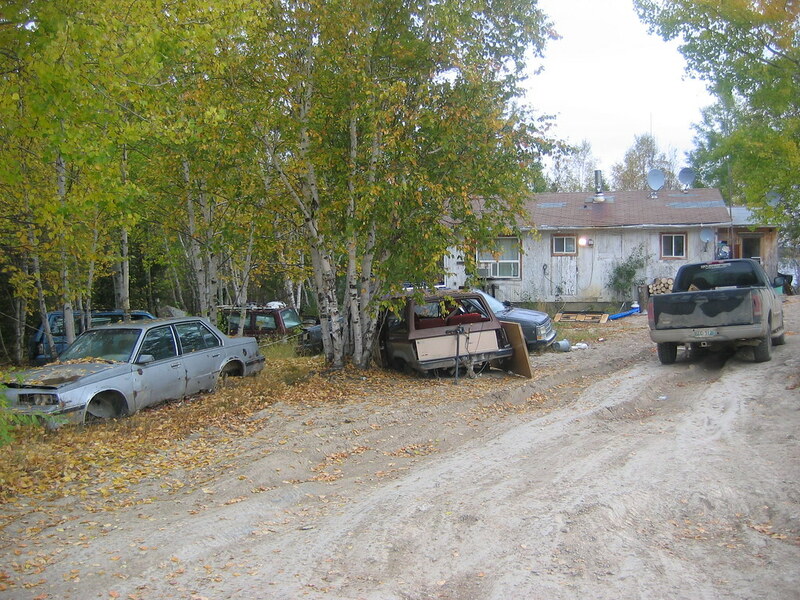 The reserve has about 240 homes, mostly small, dilapidated and overcrowded. They are scattered around the reserve, along unpaved, bumpy roads, flanked by rubbish and broken-down vehicles, many gutted by fire. More than half the homes are in need of thorough renovation or demolition. Construction materials are hard to come by, however, as it is expensive to import them. New houses are scarce, so young couples often live with their parents. 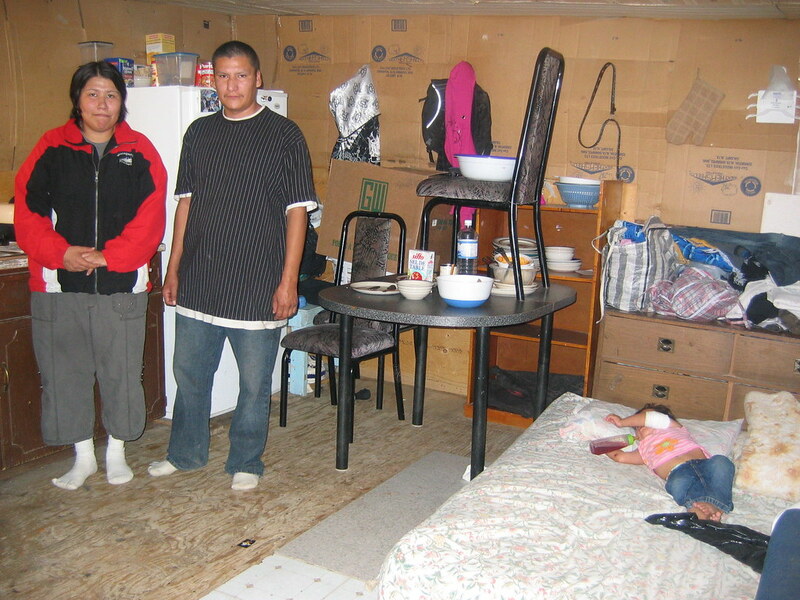 Wasagamack residents Joseph and Paula Harper in their one-room home. Joseph and Paula Harper and their four small children have their own house: a one-room structure made of wooden boards. On the outside, it is covered with see-through plastic for isolation; inside, cardboard is used for that purpose. A wood stove with a pipe through the roof provides heat – but the smoke is affecting the family’s lungs. 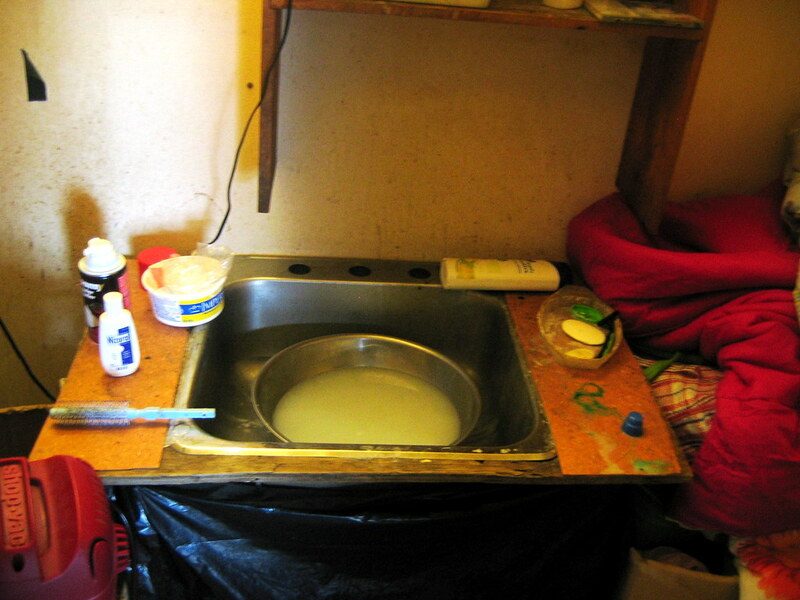 The kitchen corner includes a sink with no running water. Mattresses are on the floor, a toddler is drinking from a bottle, a baby is in a childseat in front of a TV. Only 10 per cent of the reserve has running water. Others can get water from two public pumps, connected to a water treatment plant. It doesn’t take long before someone shows up there. John Harper, a young man in sunglasses and a hoodie, fills a few large buckets and puts lids on them. In winter, the pump sometimes freezes, however. People with a water tank under their house can have water delivered by a water truck. 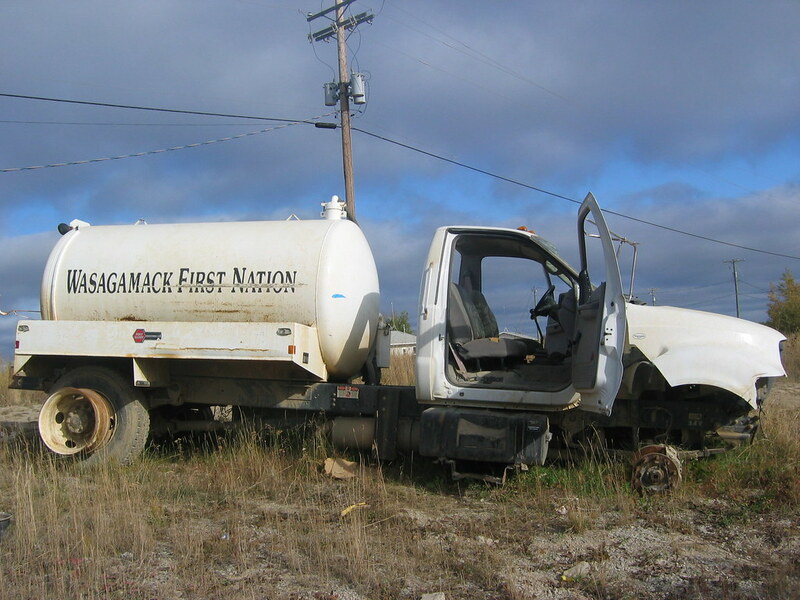 A Wasagamack resident gets water at one of the water pumps in the community. Elderly people also get water deliveries. Elders like Robina Harper, a 64-year-old woman with severe arthritis. She’s coughing constantly and has a sore throat, she says. 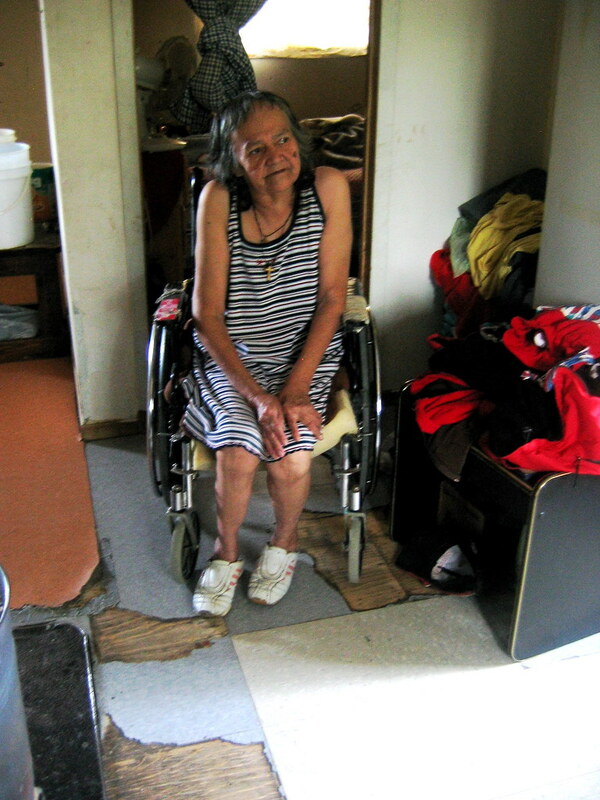 Her wheelchair with broken arm rests rolls over bare spots between linoleum tiles in her dry kitchen. She is unable to go to the outhouse, and uses a so-called slop pail: a bucket with a garbage bag, under a plastic chair with a hole. She’s waiting for an appointment with a doctor who comes to the reserve for a day and a half each week. Robina Harper, an elder inWasagamack. There is help, but it’s not going smoothly. The Canadian government pays for flights to take seriously ill patients to Winnipeg – a lengthy and costly process. A call by chiefs to establish emergency clinics has been rejected. Moreover, help with prevention is hampered by painful misunderstandings, as often happens in indigenous-white relations. Some reserves in Manitoba, including Wasagamack, received shipments of medical supplies that did not only include facemasks and gloves, but also dozens of body bags. There was a big outcry. The Canadian Minister of Health, Leona Aglukkaq, has acknowledged that her department made a mistake. There was “clear overestimation,” she said. 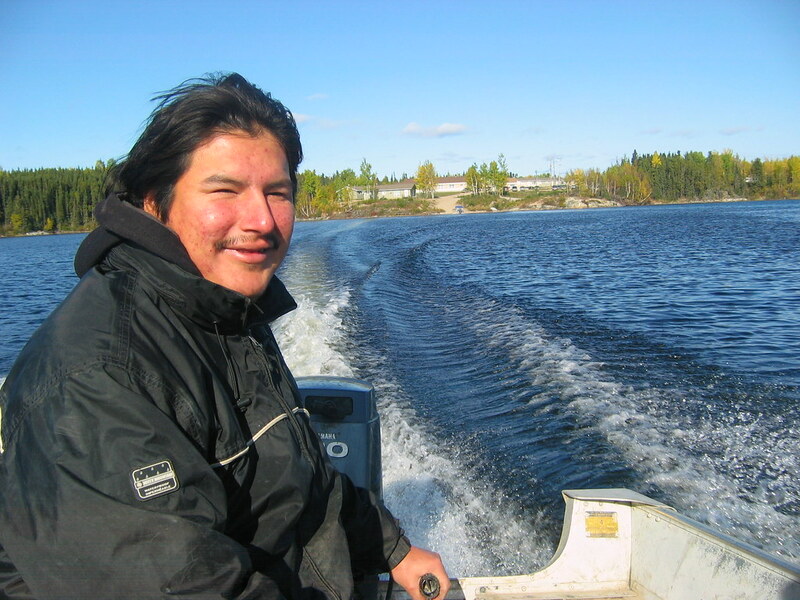 According to Aglukkaq, who is of Inuit background, most indigenous communities are “ready for a new wave of H1N1”. Of the 600 indigenous communities, 90 per cent has an emergency plan in case of being struck by the pandemic, she says. 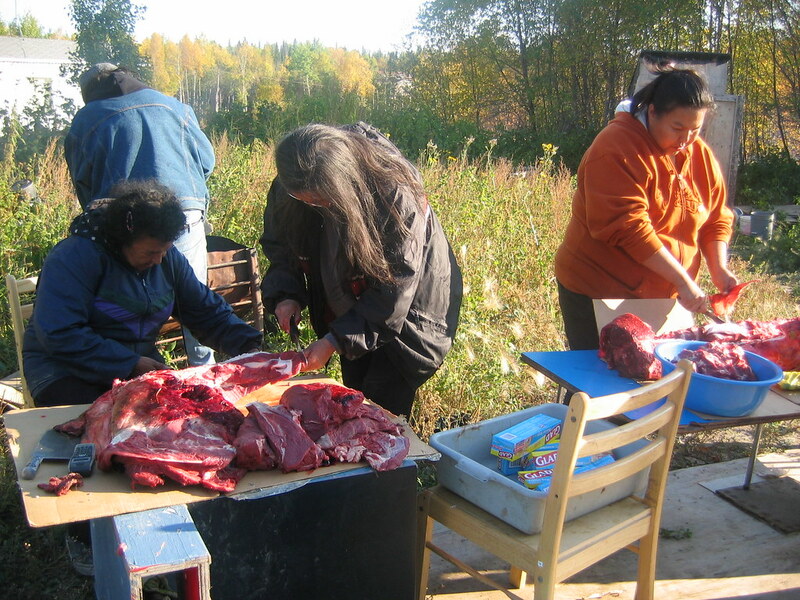 Some in Wasagamack consider the panic over H1N1 as yet another problem for a community that is already struggling with problems like poverty, housing shortage, high unemployment and alcoholism. Sitting at his kitchen table, Jeffrey Whiteway shows the medication he has at the ready. 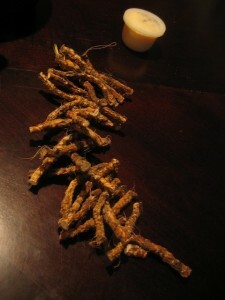 Dried roots of water plants, harvested at low tide, are used to make tea, he says. Mint leaves should help against a cold. Cedar tea helps relieve headaches – he offers a cup, made with water from a water tank by the front door. He also recommends bear grease as a body ointment. 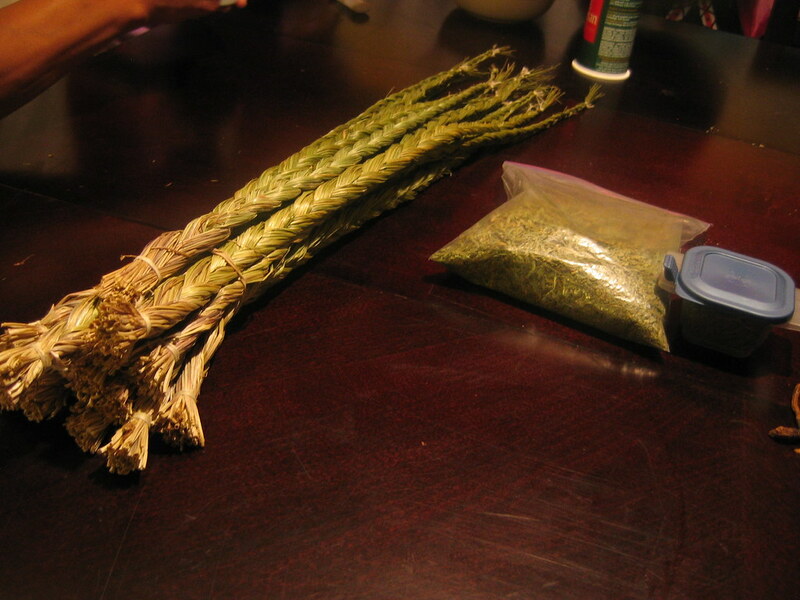 And there is braided sweetgrass, it produces a sweet weed odour when lit – a relaxant. Wasagamack is a ‘dry’ reserve, but alcohol is making the rounds anyway. Liquor is smuggled in and brewed on site. In recent years there has been a problem with so-called ‘super juice’, a strong brew of yeast, water and sugar. 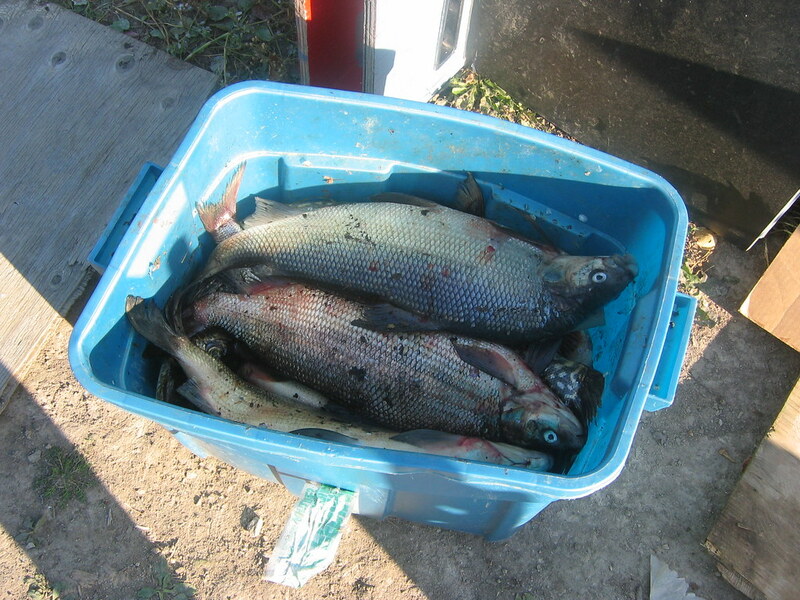 It is often prepared in vats outside. Because of the alcohol problems, hand sanitizers to combat H1N1 are controversial – some hand sanitizers have an alcohol content of 60 per cent. The Department of Health hesitated to distribute them, for fear they would be consumed. Nevertheless, an indigenous organization in Manitoba is now handing out anti-flu kits with painkillers, thermometers and disinfectants.